In my last blog I expressed concern over the future of medical cannabis. Doctors must step up to the plate and once again take control of treating their patients with medical cannabis. Relying on growers, manufacturers, or dispensaries to educate and guide patients can no longer be expected. In fact, state medical boards are now crafting rules and regulations demanding doctors to perform good medical practice when dealing with cannabis patients. California’s SB 643 sets forth standards for physicians recommending cannabis, and prioritizes California Medical Board investigative and prosecutorial resources for oversight purposes. Physicians must perform a good-faith examination and refrain from clearly excessive recommending of cannabis (read “recommendation mills”). In response, the Medical Board of California produced a draft, Guidelines for the Recommendation of Cannabis for Medical Purposes, in November 2017. I wish. As with many good ideas, the devil is in the details. Let’s take recommendation number four above, “treatment agreement.” The California Medical Board has come up with a draft treatment agreement that would make a patient think he/she is about to agree to the use of a dangerous drug that could lead to uncontrolled use, harm to children and adolescents, heart attacks, psychotic episodes, increased risk of lung cancer if one already smokes tobacco, traffic accidents, and a withdrawal syndrome. Not only are the facts erroneous and misinformed, but one gets the idea that the primary purpose of the agreement is to protect the physician from liability rather than protect the patient from harm. 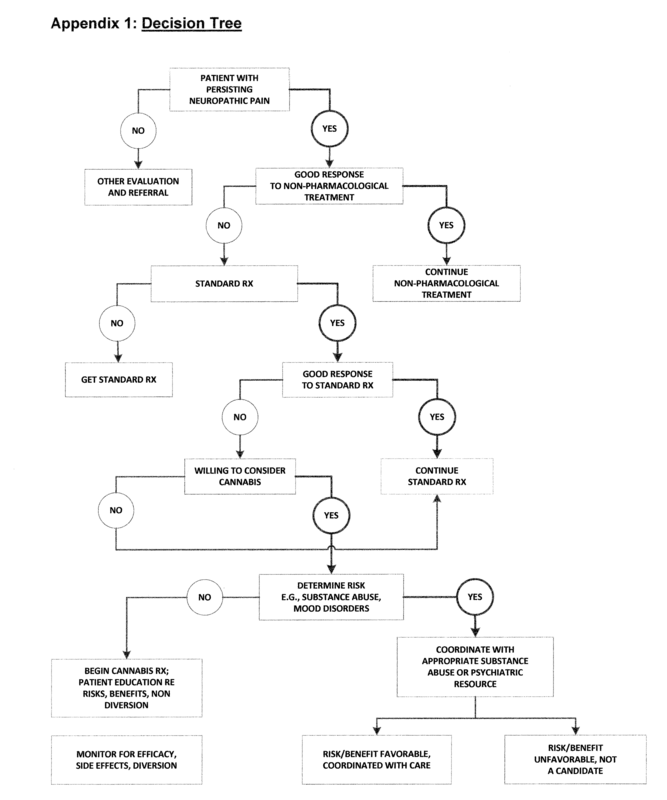 To add to the impression that the California Medical Board is fumbling around, not really understanding what they are doing, they have published a draft “decision tree” (see image above) as an appendix to the Guidelines. If one reads the guidelines and then looks at the decision tree, it becomes obvious that the decision tree does not reflect what is in the text. In the decision tree, the use of cannabis as medicine is meant as a treatment of last resort after standard treatment has failed, while in the text (luckily) this is not the case. Trial and error, thus. Help! Is there anyone out there to help the medical community come to grips with what is happening to medical cannabis?